This time she made sure that I wasn't cheating and looked immediately at the weighing scale. 170 grams in 7 days. She's the biggest among 102 chicks. Average weight would be 140 grams. Yesterday was their second week. unfortunately i had to be somewhere else so i was not able to visit our farm. 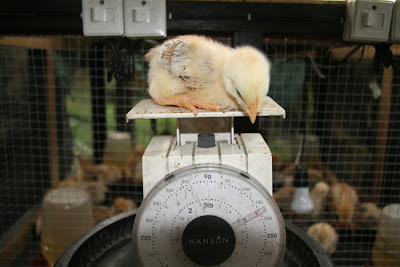 but my brother told me that they weigh an average of 275 grams. some were only 180 and some were 300 grams.